Get a taste of the rich local culture of rural Karnataka at Vihangama Holiday Retreat that’s near the Tunga River, in Thirthahalli. There’s plenty to see and do here. A stark contrast to the hustle and noise of Bangalore city, you can find peace and tranquility not too far away in the town of Thirthahalli. Check into Vihangama Holiday Retreat to unwind, with plenty of lush green to surround you and a warm reception from the friendly folks running the place. FYI, Thirthahalli is a town celebrated for its unique local culture, that even the great Kannada poet, Kuvempu spoke of it in his work. Although it’s a rather quiet town, there’s plenty of activities to put on your itinerary. From boat rides to cycling around town, both of which are organised by the Holiday Retreat itself, explore the great Tunga river that’s really close by and the many surrounding forest trails that you can wheel through. Indulge in delicious Malenadu cuisine (think plenty of seafood and rice) and interact with the friendly locals that will show you a good time while you’re here. Curl up with a great book in their roomy villas and cottages, most of which have a private sit out with great views of the Tunga river. Speaking of the river, head on down to the (pretty close to private) beach close by for some sun and sand. 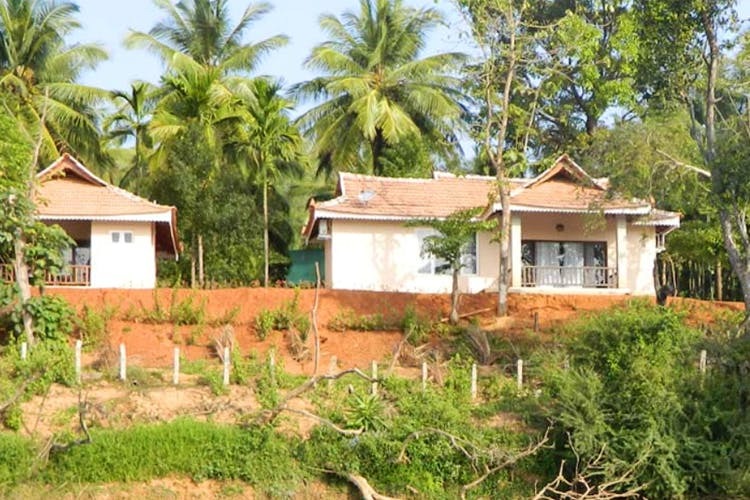 The Retreat is quite a large property with an outdoor area, arecanut plantation and a lounge. You can also play a game of carrom or table tennis here, or pick up a book to read from their bookshelf. The tariffs start at INR 2,500 for two people in their standard cottages. Groups of six can book out the Bunker Cottage at INR 5,000 (That works out to about INR 850 per person). Food, boat rides and cycles on rent come at an additional cost. So what’re you waiting for? Plan your sweet escape right away. Mobile signal might be an issue with most networks.